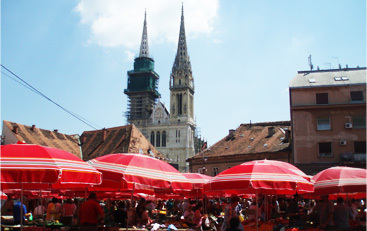 I found out about inZagreb through a traveller guide (Lonely Planet). We had a great stay in your very comfortable and well-equipped apartment Olive. Thank you very much, we hope to return very soon! You seem to have thought of everyting. Thank you. We thought Zagreb was a great city and we would recommend inZagreb to anyone. Service is fantastic! Great reception - thanks Ivana! Prompt replies to e-mails. Very good website! Pick up at the bus station appreciated. Fruit basket, wine and weather report - excellent! The apartment Orange was great! Very clean and spacious, a nice home base for long busy days in the city. Ksandro was very gracious and was available for our every need. I would highly recommend inZagreb apartments to my friends and family. It was first-glance love! In your cozy apartment I felt like home and would like to come back over and over again! This apartment feels like home. A warm welcome because of finding fruit, cafe etc. Service is great (maps, weather prognose...). Everything is top, super! We enjoyed Zagreb. The apartment was great and in an ideal location. In addition it was well furnished. The condition of the flat is excellent and the facilities provided very well thought out. The location of the flat is ideal for exploring Zagreb centre, very easy to walk to mots places and feels safe. The service provided is efficient, friendly and helpful. We will happily recommend you to friends and would use your services again. We loved this apartment. It was good to see where some locals live. Good that bus was handy. I very much enjoyed staing at the "City" apartment. Merci! Very nice apartment. A trash can in the bathroom would be nice (we will buy one! - Ivana). I enjoyed the fresh fruit you left for me - thank you! It was a very good experience to stay in the apartment City. Being clean and comfortable. We had the advantage of bing in the centre. Thanks again for all your help (especially Split guide). We loved it and recommend to our friends. Hope to see you soon! Both the apartment and the staff surpassed our expectations. Thanks for a marvellous stay in Zagreb! We have had a great time at the Forest apartment. It was very comfortable and beautifully designed inside. I hardly wanted to leave the apartment to explore the city! We will certainly recommend you to anyone we know going to Croatia. Very nice and cosy, clean and comfortable. Great service and garage! I'll pass it on to friends and family. We loved staying in one of the inZagreb apartments. It was like being home in a different city! We took a nice bikeride to Bundek and also the bus/tram rides were close by. For our son it was nice, he had its own bed and could freshen up in the bath tub. The welcome was also very nice - we were provided all necessarry information! We had a wonderful stay in the apartment Forest. We really felt like at home, except that it was fresher than in our apartment in Lyon in August! Loved it! More than we expected - touches like coffee and tea, oil etc - brilliant. Highly recommended. We are back in Sofia now and I would like to tell you that we had a great time in your country - it is really beautiful. The apartment was great, it is really very well thought about everything. I will recommend it to any friend that goes to Zagreb. Great apartment and very good location. Apartment Forest was comfortable and cozy. All the home stuff I needed were in the apartment: dishes, washing machine etc. I very much enjoyed my stay here and would like to come back and try another apartment as well. My only suggestion would be to put some blinds in the bathroom. Other than that, everything was great! P.S. Thanks for the new bed for my guest. Enjoyed our stay very much. Great location, with easy access to everything we needed. Thank you. Suggestion - bread knife would be a great help in the apartment. I just wanted to say many thanks for looking after me so well on my recent Zagreb trips. The apartments have been very much appreciated and I hope (don't know when though) to come back to work in Zagreb again in the future. I hope your holiday went well and will keep in touch. Mine was lovely. Have to admit I love the sea so Zadar was excellent in every way! Excellent, clean, functional and central. Enjoyed our stay very much and would come again.